The other day while driving into town I saw something weird crossing the road. And they didn’t scurry like mice, or slither like snakes, they inched. Being of the curious type, I pulled over. hmmmm okay, that may be a slight exaggeration, but I have never seen anything like this before. And all within just this 25 yard stretch of road!! Craziness! Pure pandemonium!! Utter chaos!! Got a little passionate there. Anyways, so I went by just yesterday and they are still pilgrimaging their way into the wheat. Just a strange phenomenon that my girls really enjoyed, and I just had to share with you all. And I can’t help but wonder, where were they going? It will be a sleepless night as I ponder this and other life altering questions. PS: I included my SOOC version of this picture on my edit page! 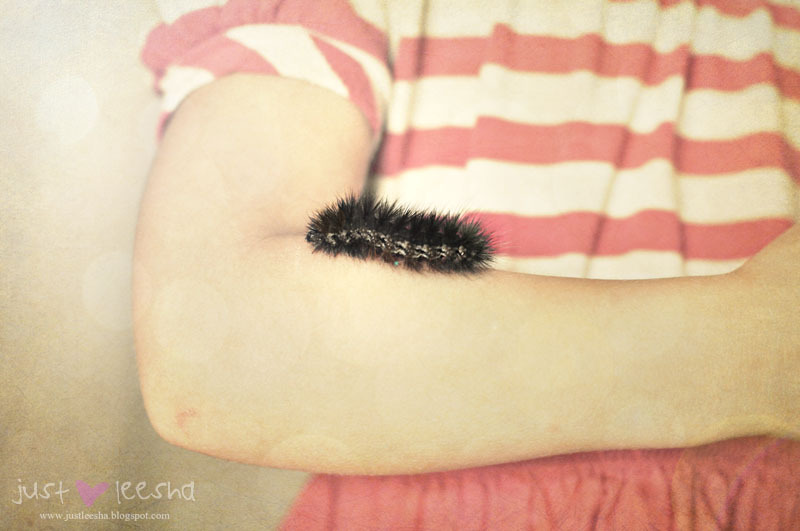 This must not be the same type of furry black caterpillars that we have each spring. Ours are awful – they sting if you touch them and it hurts bad. Bad enough that I don’t take any chances with any caterpillars! Your photo is really cute. Your caterpillars are obviously nicer than ours! Love the contrast of the pink and black and your edit looks great! What a cool sight. My son would love that! I hardly ever see anything like that, let alone more than one. But I bet she liked it! Oh my. She is brave! My three year old would’ve loved them She loves creepy crawlies. Cool shot. Wow. I couldn’t imagine seeing that many caterpillars! Crazy! Cute photo! thats awesome, what a great shot!